UK drivers using the M6 Toll Road will be able to pay for their journeys using contactless credit and debit cards from as early as February 2012, says Barclaycard. 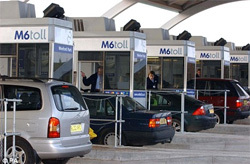 The M6 Toll is working with Barclaycard to install contactless payment terminals at toll booths, allowing customers to pay by simply passing their card over a reader. The technology will initially be trialed on a single lane in fall 2011, with the aim of expanding the technology across all card-accepting toll booths in the first quarter of 2012. Barclaycard will manage all card transactions. Opened in 2003, the three-lane road spans 27 miles, providing a northern route around the city of Birmingham, England.